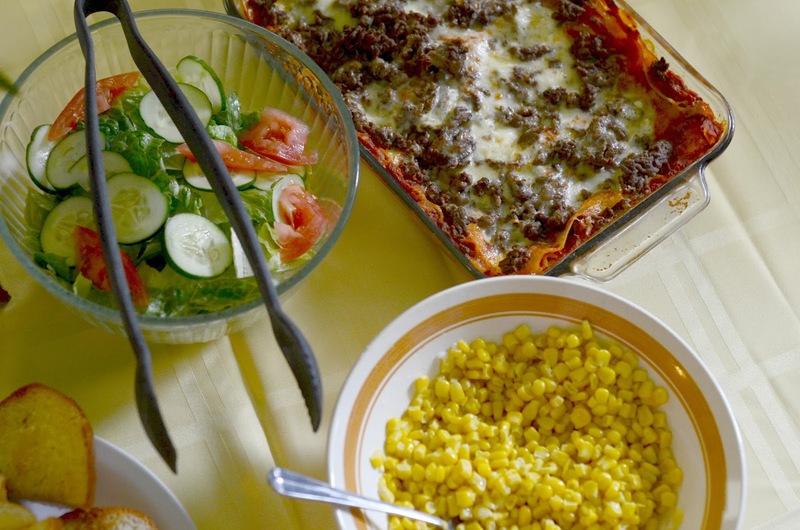 When we lived in Provo, I loved to cook a big meal for my family for Sunday dinners. We would always invite my brothers, then eventually their wives, and our cousin Alan over for a veritable feast. I found great joy in pulling out all the stops... lots of side dishes to supplement my main course, plenty of fresh fruits and vegetables, a delectable dessert, and all enough to feed an army. My brothers so graciously fawned over the food, playing to my pride and eating mountains of it. I grew to love feeding hungry boys. It's a very happy memory in my mind. It's one of the reasons I love feeding missionaries: if nothing else, it reminds me of feeding my brothers. 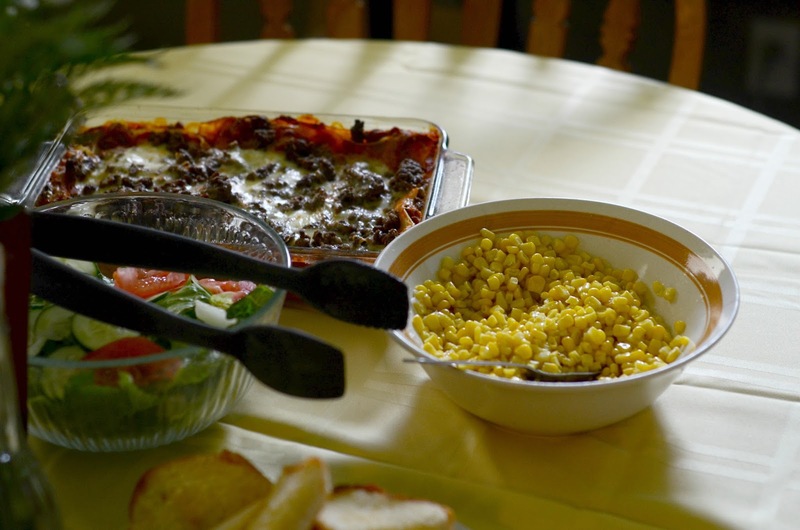 Once we moved, we didn't have any family who could come over for Sunday dinners. I'm no stranger to entertaining guests, though. Before we had my brothers over for dinner, Ben and I went to a young married ward for church, and once a week we would try and invite another couple over to try and get to know them. When we moved here I thought it was a good idea to step back from others for awhile and focus on our own little family. It forced us to draw closer to each other and start our own traditions. Lately, however, I've been feeling like I have this gift with food. The other day when Ben and I and the kids sat down to eat this beautiful Sunday feast, I felt an impression-- this needs to be shared. This gift that I have, this food needs to be shared with others. I'm not a crazy-good cook, but people usually like what I've made when they come to visit us. And unless it's a really large crowd, I usually like making a big meal for people to enjoy. I don't like to call it "entertaining" because there's nothing fancy about what I do-- we eat on mismatched plates and in our tiny kitchen. I might throw on a tablecloth or a vase of flowers, but really the star is the food, and the happiness I have when making it for other people. Food is a love language for me. One of my favorite sounds is the satisfied sigh someone gives after eating something I've made. I love feeling powerful and capable, delivering that happiness, recognizing that I can give that to someone else. Eating is something we all have to do, and I feel blessed with that gift to make it enjoyable for other people. I had a friend once tell me that I was like the Savior in that way-- he also used food to tell people he loved them. He was always feeding those multitudes that followed Him. As a mother, so much of our time revolves around food-- preparing it for others, cleaning it up, and buying it. We can decide whether to be grouchy about that fact or see it as an act of love and service. Everyone needs to eat, we are all mortal. Are you willing to humble yourself and serve others in that way? So often as a stay-at-home mom we allow "food preparer" to be one of the ways we demean ourselves. We don't have "leads important corporation" on our job description, instead we serve food all day. If it's good enough for the Savior, it's good enough for me. And as a bonus, if a "food preparer" can also bring people joy, what a happy way to serve. Love love love love love this! Especially the last paragraph. I stalk you Carly ;). What your mom said a few posts back really struck me and I haven't been able to forget it. It really changed my perspective. Please thank her from me, a stranger! !